The historic town of Atlin, on Atlin Lake dates back to the Klondike Gold Rush of 1898, when the population was more than 3,000. Today, the town has a population of approximately 500 and is a favourite spot with tourists. Atlin Lake, with its turquoise coloured water, is the largest natural lake in British Columbia. The town, the lake and the wilderness park are all drawing cards to this northern region of BC. The snow-capped mountains serve as a backdrop, as boaters and canoeists explore the many islands on Atlin Lake. Houseboating is becoming popular and float planes lift off taking hikers and fishers into the remote wilderness. Atlin Lake is 100 km. (60 mi.) in length. Winds can whip up suddenly, so stay close to shore and always be very careful. Atlin Provincial Park, a wilderness park, which encompasses most of the lake, offers wilderness walk-in camping. Along the lake shoreline you might see Dall and Stone sheep, mountain goats, caribou, and bears. Bird watchers will be pleased with the abundance of bald eagles, ospreys, spruce grouse and ptarmigans. To reach Atlin, turn south at Jakes Corner off the Alaska Highway and follow Highway 7. Wildlife photography, bird watching, hiking, back country camping, canoeing, kayaking, gold panning and boating are activities that can be enjoyed in this area. The town of Atlin has complete tourist facilities and amenities, such as accommodations, camping, restaurants, craft shops and sight seeing tours, guiding, rental of houseboats, pleasure boats, canoes and kayaks. Atlin, Atlin Lake and Atlin Provincial Park are fast becoming a mecca for back country hikers and adventurers. Babine Lake, in the North by Northwest Region, is 177 km (110 mi.) long, making it British Columbia's longest natural lake. Babine, is also one of the most popular fishing lakes in the province. Fly fishing and trolling yield results of cutthroat and rainbow trout. Also, enjoy fishing for lake char and kokanee. This is a major salmon spawning area and the months of August and September are the best times to view this natural phenomenon. The Village of Granisle on the shores of Babine Lake, is a good place to make home base as you fish, boat and explore. Granisle is 50 km (31 mi.) north of the Yellowhead Highway on Highway #118, situated on the widest part of Babine Lake, offering visitors everything they need. Recreational facilities include a marina, boat moorage and boat launches, parks, beaches, pool, tennis courts, curling club, museum and hiking trails. Mountains and beautiful scenery surround Babine Lake, while the shoreline is dotted with secluded sandy beaches. The area offers wildlife viewing at its best, with a chance of seeing deer, moose, coyotes, wolves, bears and eagles. Enjoy swimming, water skiing, boating, wilderness camping, hunting, hiking, cross country skiing, snowmobiling and of course, fishing all year long. There are camping facilities at Red Bluff Provincial Park, Topley Landing Campgrounds, and Lions Beach Park or take adventage of the accommodations at the lodges and resorts in the area. Enjoy pristine wilderness and some of the best fishing in BC on Babine Lake and the surrounding area. The Lakes District of British Columbia offers more than 300 fishing lakes between the Fraser and Skeena River watersheds. Burns Lake is the largest community and the service centre for the Lakes District. The area boasts of having more than 4,800 km (2,900 mi.) of shoreline and fishing opportunities. 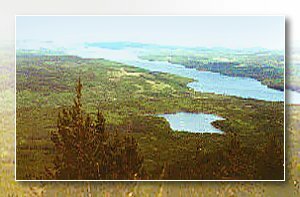 Francois Lake, 120 km. (75 mi.) long, is the largest lake in the district. Highway 35, south of Burns Lake takes you to Francois Lake and the fishing grounds. A short free ferry ride crosses Francois Lake to Southbank and beyond to Uncha, Takysie, Ootsa Lake and the northern section of Tweedsmuir Provincial Park. One of the purest water sources in BC, Francois Lake has plenty of rainbow trout, kokanee, Dolly Varden and char. This is sport fishing at its finest, with prize winning, trophy fish. Pack your camera and be ready to snap pictures of the wildlife. Eagles and ospreys are plentiful. Bears, moose and deer wander freely. The Lakes District offers many recreational activities. Relax boating, fishing, sailing and canoeing. Go hiking, backroad exploring, rock hounding, bird watching, fossil looking and hunting. Do a Burns Lake walk-about visiting the museum and other historic sites. The shores of Francois Lake offer many excellent private RV and Campgrounds, and the village of Burns Lake has accommodations, restaurants, shopping and entertainment facilities. For a holiday of relaxation and fishing, make it the Lakes District and Francois Lake. Stuart Lake situated 60 km (37 mi.) north of Vanderhoof, which is the geographical centre of British Columbia, is an excellent fishing and boating lake. This area is also rich in history. The village of Fort St. James, on the shore of Stuart Lake, was one of the first fur trading posts in British Columbia. Founded in1806 by Simon Fraser it was the headquarters of New Caledonia. The fort, rebuilt four times, continued as an important trading post right into the twentieth century. Today, the fort is a National Historic Site with some original buildings dating to the 1890's. During the summer, costumed staff members reenact life as it was nearly 100 years ago. You can also enjoy learning about traditional salmon smoking and drying by the Carrier people. Stuart Lake, is 95 km. (59 mi.) long and home to some of the finest rainbow trout fishing in BC. No matter where you go on the lake, fishing is excellent. This long and narrow lake has sandy beaches, isolated bays and coves and native pictographs on the rock bluffs along the east shore. Stuart is the southern point in a chain of three lakes and a popular canoe trip. Like other BC lakes, wind and storms happen suddenly so always be caution. Make your home base at Paarens Beach Provincial Park, it is the perfect spot from which to explore the historic Fort St. James region. Located on the south shore of Stuart Lake, Paarens has excellent camping facilities. The village of Fort St. James offers accommodations, restaurants and shopping. There are many lodges and resorts in the area. Also, available are fishing charters, float plane charters, motor boat and houseboat rentals. Stuart Lake and surrounding area are truly for the outdoor adventurer. Offering excellent boating, fishing, canoeing, kayaking, swimming, hiking, back country exploring and historic buildings to visit and enjoy. Combine a boating and fishing holiday with history on Stuart Lake and at Fort St. James area.